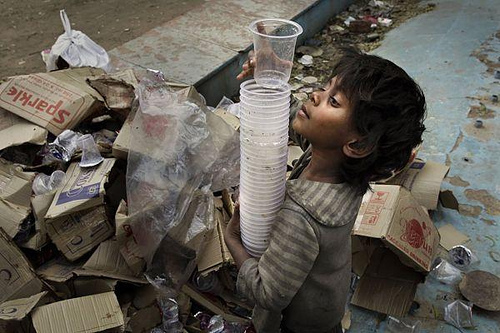 The Independent India: Children of the Independent India working as rack pickers and Slaves in their own Home. Children of the Independent India working as rack pickers and Slaves in their own Home. I was shocked when I saw a child which was approx 3 years old cleaning the roads by picking up the racks in search that his dream come true and he me found some old clothes or discarded shoes or something else. he was not a single guy there was a troop of many of them in search of something which is discarded by someone else. toned shoes , clothes and a meal twice a day is like something very special for them. These such small children have to beg in front of people like us to fight with hunger They try their best for entertaining the public so someone give them a little money only to fight against hunger. These children are helping hands of their parents because their parents are not earning even that much that they can give their children sufficient amount of food. I talked to one man of the community about their conditions and I found that they are pushing their max just for earning some amount of food they even can't think of buying clothes , maintaining their houses or something else. Now is this the progress of our country that a large number of people in our country are not earning even that much they don't have to send their children to work as laborers. On one side we are investing millions of rupees in the thinks like elections, paying huge salaries to people of government houses and etc. The last thing I would like to say is that a building without proper base can't tolerate a good amount of weight same is the condition of our country we only looks good because we only see the good things of our country and we mostly times ignore the reality of India. postingan yang bagus tentang"Children of the Independent India working as rack pickers and Slaves in their own Home"
Yes a pitiable situation indeed of a lot of kids in our country. And all our so-to-say "leaders" are interested in is - how to work the next scam.